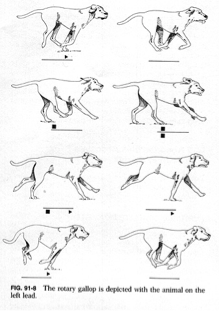 Dogs generally have 4 different gait patterns, which change through speed for energy consumption. The force increases with the speed of the gait. The muscles generate greater force which reduces the time to propel the body forward; the Tendons then act like springs and aids in propulsion.